Set your event apart from others' and turn it into a truly memorable occasion for your guests - send everyone home with a party favor. A party favor is a thoughtful memento given to your guests as a way to express gratitude for sharing your special occasion with you. Saying "thank you" crosses all cultures and languages and is something everyone can understand. What's more, you can incorporate your party favor into the theme of your party. When selecting a party favor, the most important considerations are your budget and the number of favors you'll require. 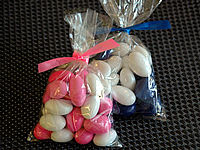 Sweethearts Three party favors are all custom-made for you, so please consult with us at least three months before your party to ensure we can produce them in time for your event. Almonds, usually in uneven numbers, are given as tokens of good fortune and happiness at weddings in many cultures. 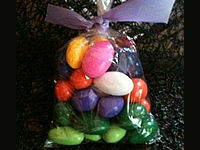 Depending on your budget, we can prepare many different size bags of chocolate almonds in your choice of ten colors. Elegant chocolate blooms can be color-coordinated with your shower colors. 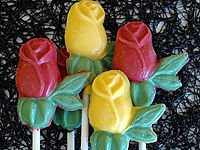 Put one chocolate rose at each guest's place-setting or display them in vases near the exit so guests take one on their way out. 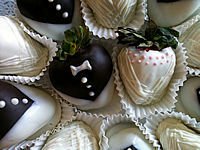 Box contains two handmade chocolate truffles (hearts, seashells, dome-shaped, round with sugar flower). 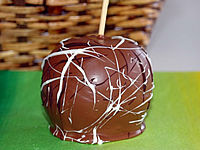 Click here to see our handmade truffle styles. Personalize the box with the bride's name and the party date. Box is available in a variety of colors to coordinate with your party. 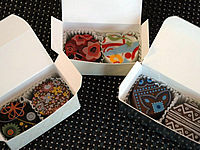 Box contains two handmade chocolate truffles or two designer truffles with elegant cocoa butter designs. Click here to see our handmade truffle styles. 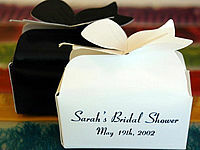 Personalize your box with the bride and groom names and the wedding date. This box is available in a several colors to coordinate with your party. Available in milk, dark, or white chocolate filled with mint lentils or jelly beans. (Box measures 2.5 x 2.5 x 1.5 inches.) Each box is wrapped in clear gift-wrap and tied with an elegant bow. 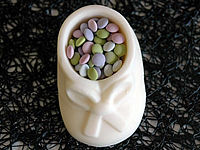 Available in milk, dark, or white chocolate filled with chocolate almonds, mint lentils or jelly beans. (Box measures 2.75 x 2 x 1.5 inches.) Each box is wrapped in clear gift-wrap and tied with an elegant bow. 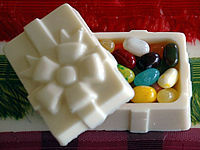 Available in milk, dark, or white chocolate filled with mint lentils or jelly beans (Box measures 2.75 x 2x 1.5 inches.) Each box is wrapped in clear gift-wrap and tied with an elegant bow. Tuxedo and wedding gown designed, hand-dipped berries are a perfect reflection of your celebration  one your guests can enjoy when it's all over. Berries must be served within 24-48 hours of delivery. Packaging options vary; call 781-784-5193 to inquire. Available in either pink and white or blue and white. Depending on your budget, we can prepare many different size bags of chocolate almonds. 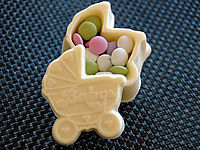 Available in milk, dark or white chocolate, filled with mint lentils or jelly beans. Each chocolate baby carriage is wrapped in clear gift wrap and tied with a bow. Available in milk, dark or white chocolate filled with mint lentils or jelly beans. Each chocolate baby shoe is wrapped in clear gift wrap and tied with a bow. 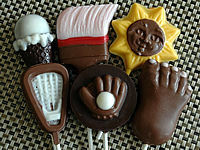 Handmade chocolate pops with your choice of baby carriage or teddy bear chocolate center. 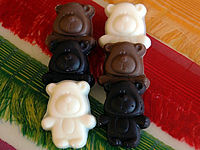 Bag of handmade miniature edible chocolate teddy bears and baby carriages (8 pieces of solid chocolate in either milk, dark or white chocolate or a combination). We have hundreds of candy molds to fit your party theme (beach, drama, sports, animals,). If we don't have what you want, we can usually order a mold for you. 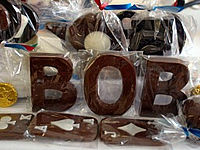 We have hundreds of candy molds to fit your party theme (beach, drama, sports, animals, fashion). If we don't have what you want, we can usually order a mold for you. 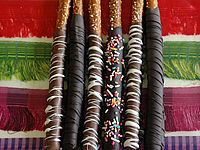 Pretzels dipped in your choice of milk, dark or white chocolate and decorated with sprinkles, nuts or chocolate drizzle. Pretzels are in a cellophane bag with a bow. 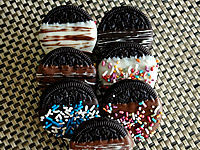 Oreo cookies dipped in your choice of milk, dark or white chocolate chocolate and decorated with sprinkles, nuts or chocolate drizzle. They are placed in a cellophane bag with a bow. Choose milk, dark or white chocolate decorated with sprinkles, nuts or chocolate drizzle or all of the above. Each apple is wrapped in clear gift-wrap and tied with a colorful bow. A multi-dimensional, two-tiered collage displaying your child's hobbies and interests - in chocolate! Not only does this make a great event centerpiece, it provides your guests with party favors, too. Each solid chocolate novelty is individually wrapped and ready to be selected by your guests. 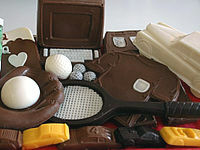 We have hundreds of candy molds to customize your collage such as drama, sports, games, animals, shopping, food and more.